A R.N. treats patients and educates the patients as well as the public about medical conditions. A R.N. makes an hourly wage of $31.71 and a yearly wage of $65,950. To be a R.N. 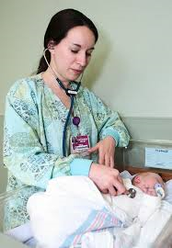 you must have :A bachelor of science degree in nursing, an associate degree in nursing, or a diploma in nursing. A normal day for an R.N. would be to: record patients medical history on medical charts, observe patients, administer medication, and change dressings. the pros/cons: nurses are a huge demand, there are abundant job options, good salaries, and decent benefits to prove it. The cons: since nurses are such a big demanding job the pressure is horrible. You could hurt yourself or just get tired and not want to do it. Promotion Opportunities: most of the time a R.N. will start out as a nurse on a hospital staff. with time and experience he or she could be promoted to head nurse.